Pactole De L’Iton won the major event on the card at the racetrack yesterday – the Equestrian Festival Championships qualifying heat for Premier Class trotters. The race, on a mile distance, formed part of the 44th meeting of the season and the programme included ten races, all heats from the equestrian championships. The Premier race was contested by ten trotters with the top three moving to the final. With a lap to go, Princess View (Julian Farrugia) surged ahead of the rest but the Swedish eight-year-old mare slowed down its pace 200m from the finish. 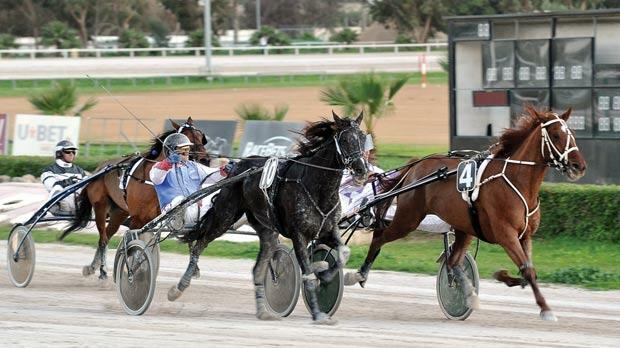 Quito D’Ecroville (Mario Borg) was first past the post but this trotter got disqualified by the stewards and the win went to Pactole De L’Iton (Noel Baldacchino) which took its first win in Malta. Made In Hoff (Charles Camilleri) was second ahead of Princess View. Sharika Trot (Clifferty Calleja) followed behind in fourth place. In the first of three Gold Class races yesterday, Quioco Dry (Joseph Galea) shot into the lead in the home stretch and went on to chalk up its third win of the season ahead of Purple Hall (Charles Camilleri), Quel Imprevu (Carmelo Micallef) and Orion Du Vaumicel (Frencu Cassar). Peanut Butter (Nathaniel Barbara) also registered its first win at Marsa in the next Gold Class heat. The mare upped its pace from the outside 500m to the end and won comfortably ahead of Mission Di Poggio (Charles Camilleri). Lover Roc (Jurgen Attard) and Quid De La Muette (Noel Baldacchino) followed home in that order. Quermes Rush, driven by young Anton Cassar, had to go all out in the last few metres of the third Gold Class heat for its second win of the year. Skip Dimanche (Victor Grech) was the runner-up ahead of Blizzard Ad (Frencu Cassar) and Nevaio Des Bordes (Claudio Refalo). Another meeting at the racetrack will be held on Saturday. The programme includes six finals over a long distance of 2,640 metres.